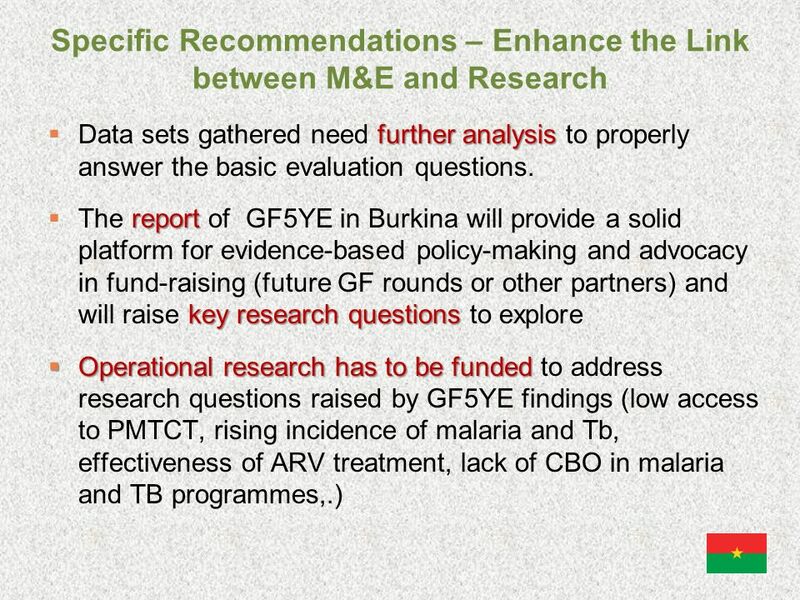 Burkina Faso Five-Year Evaluation of the Global Fund (GF5YE): Study Area 3 – Health Impact Sharing experiences in linking M&E to research linking M&E to. 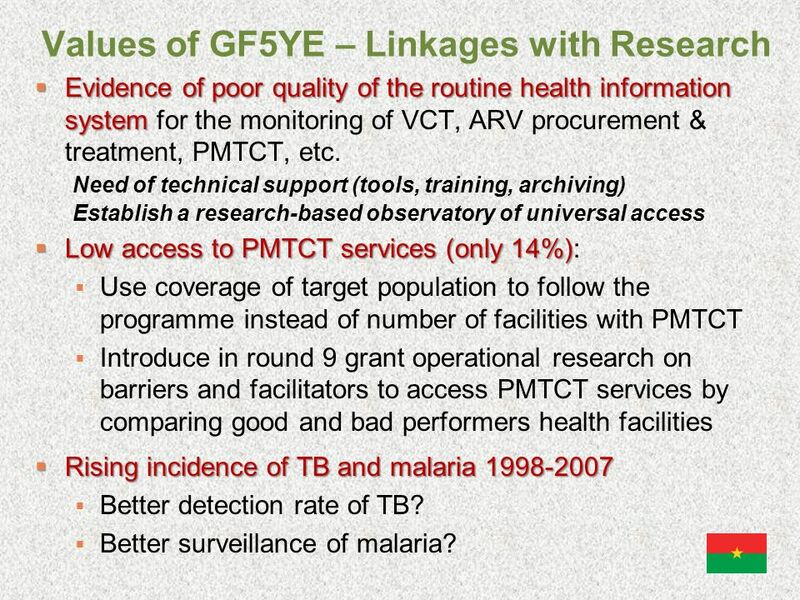 3 Values of GF5YE – Linkages with Research Evidence of poor quality of the routine health information system Evidence of poor quality of the routine health information system for the monitoring of VCT, ARV procurement & treatment, PMTCT, etc. Need of technical support (tools, training, archiving) Establish a research-based observatory of universal access Low access to PMTCT services (only 14%) Low access to PMTCT services (only 14%): Use coverage of target population to follow the programme instead of number of facilities with PMTCT Introduce in round 9 grant operational research on barriers and facilitators to access PMTCT services by comparing good and bad performers health facilities Rising incidence of TB and malaria 1998-2007 Rising incidence of TB and malaria 1998-2007 Better detection rate of TB? Better surveillance of malaria? 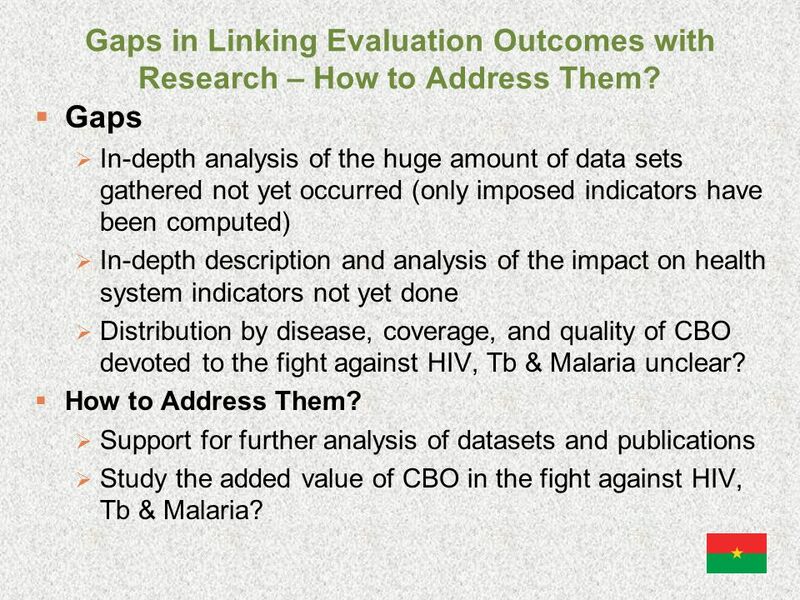 4 Gaps in Linking Evaluation Outcomes with Research – How to Address Them? Gaps In-depth analysis of the huge amount of data sets gathered not yet occurred (only imposed indicators have been computed) In-depth description and analysis of the impact on health system indicators not yet done Distribution by disease, coverage, and quality of CBO devoted to the fight against HIV, Tb & Malaria unclear? How to Address Them? Support for further analysis of datasets and publications Study the added value of CBO in the fight against HIV, Tb & Malaria? 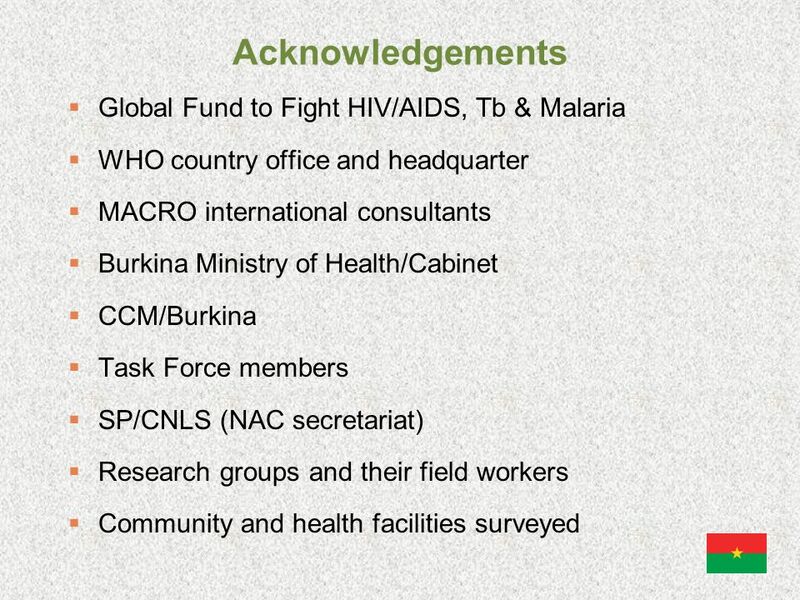 Download ppt "Burkina Faso Five-Year Evaluation of the Global Fund (GF5YE): Study Area 3 – Health Impact Sharing experiences in linking M&E to research linking M&E to." Parallel Session on Monitoring and Evaluation to Inform Action and Set Direction fro Research Five -Year (5YE) Evaluation of the Global Fund Tuesday, 18. Global Child Poverty and Disparities Thailand. Child Poverty 2006 Child Poverty 2.9 million Orphans 5.4 million Orphans & Poor 0.7 million Disabled children. TB/HIV Research Priorities in Resource- Limited Settings Where we are now and some suggestions for where to go Paul Nunn February 2005. Global Alliance for Vaccines and Immunization. n An Alliance u Traditional and new partners u Public and private sector n Partners have in common: u Situation. Technical cooperation with countries Technical Cooperation for essential drugs and traditional medicines September 2005. Track C on prevention issues Recognised Priority technical areas are ITNs, malaria in pregnancy, vector control, including use of DDT epidemics and complex. The relative importance of DOTS. DOTS Strategy 2005 Prevention starts with cure : New STOP TB Strategy -Development of new medical technologies. Unit 1. Introduction TB Infection Control Training for Managers at the National and Subnational Levels. Development Policy Lending Retrospective Customization, Flexibility, and Results OPCS, Country Economics. Restructuring the Cancer Programs and Task Force Workgroups. Key elements to develop a national strategic plan for TB control Malgosia Grzemska Stop TB Department WHO, Geneva, Switzerland EURO/TBTEAM Regional Workshop. 1 2009 Development Policy Lending Retrospective Customization, Flexibility, and Results OPCS, Country Economics.